So, this is the first Mother’s Day without my mom. It was pretty sad, but everyone at the Cuene house tried their best to hold it together. There was a mass for her Sunday, and we all got together at my sisters on Saturday night for a cookout. Everyone felt a little off, as you might imagine. 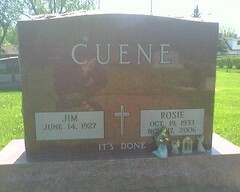 The “It’s Done” on the tombstone is a long, long story. My dad put it there as a bit of an honor to Rosie, because she used to always say it as a way to close out a discussion or argument. It was a way to say, essentially, “get over it and move on”. It became sort of an inside joke as they dealt with Rosie’s illness, so he felt it was appropriate. But, there’s another side to the story, a deeper meaning of the line. It’s a rich symbol to me for something a bit more sad. But, that’s another post. Next Next post: What’s Cooking Grandma?